Although the sun is less visible in winter, it is still present. Therefore, sun protection remains important if you go outdoors. Although the sun’s presence usually delights us, everyone knows that exposure to the sun can have negative impacts. In fact, the sun releases ultraviolet (UV) rays, UVA and UVB rays being the most well-known. While UVB rays are responsible for the classic sunburn, UVA rays are mostly responsible for the appearance of a suntan during sun exposure. Both contribute to premature aging of the skin. Moreover, it has been shown that sun exposure can lead to various serious health problems, including the development of skin cancers. Fortunately, adequate sun protection reduces the risks associated with UV rays. Contrary to what one might think, the sun is not less harmful in winter. In fact, up to 80% of UV rays are reflected on the snow. Therefore, your skin is not only exposed to the UV rays which emanate from the sky, but also to those reflected on the ground. This is also true during cloudy days, since a large portion of UV rays get through the clouds. Moreover, individuals who practise mountain sports in winter increase their exposure to UV rays. In fact, the higher the altitude, the greater the exposure to UV rays. It is estimated that for every 300 meters above sea level, exposure to UV rays increases by 4 to 5%. Finally, the winter cold tends to mask the feeling of warmth by the sun on the skin, preventing us from feeling the burning effect that it produces. Thus, we have the impression that we are protected from the sun, when in fact, we are not. For additional information about how to choose the best sunscreen for you, consult the following text: “What should you look for in a sunscreen?”. Sunscreen should be applied at least 30 minutes before exposure to the sun, and should be reapplied every two hours or following excessive sweating. If it is snowing abundantly, it might be necessary to reapply it more often. Choosing an over-the-counter product from a wide range of choices, such as for a sunscreen, can be a daunting task. Pharmacists are familiar with the different brands and the nuances between the available products. Ask them for advice before purchasing a sunscreen. Wear a hat. In addition to protecting you from the cold, a hat will also prevent you from getting a sunburn on your scalp and your ears. Remember to protect your eyes! Because UV rays can be harmful to eye health, wear sunglasses or ski goggles with integrated UV protection. Protect your lips with a lip balm which has UV protection. Avoid sun exposure when the sun is at its strongest, between 10:00 a.m. and 4:00 p.m. Regardless of the season, getting a sunburn is never pleasant. Furthermore, in winter, the cold, wind, heating, and dry air all take a toll on your skin. Take care of your skin by protecting it from the sun’s harmful effects. 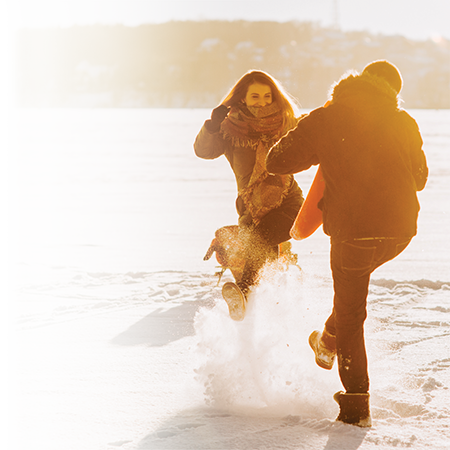 Now, it’s time to take advantage of the joys of winter! Speak to your pharmacist for additional information about sun protection.